SabarimalaQ Bus Tickets along with Virtual Q Entry tickets book online now. Buy Pampa to Nilakkal and Nilakkal to Pampa AC, Non AC bus tickets online at sabarimalaq.com. This year major update and important thing happened at sabarimala is Stopping the private vehicles at nilakkal. Many devotees who have years of experience in Sabarimala pilgrimage also need to know. After the controversial verdict by Indian Supreme court, Kerala sabarimala Ayyappa Temple was given permission for women entry who belong to young and middle age. The kerala police taken this year initiative to next level. Not only they started the sabarimala virtual q darshan tickets booking early November, But the stopping of private transport at Nilakkal itself for security reasons. Religious goons are taking advantage of sensitive situation at sabarimala temple. So for safety and protecting the temple integrity, Kerala police chosen Nilakkal which is 20 kilometers from Pampa river bank. Kerala Road transport operates the buses from Nilakkal point to Pampa river bank. Every Ayyappa Swamy who have taken Deeksha must take bath in Pampa River. To ream Pampa river from Bustop it is very long. 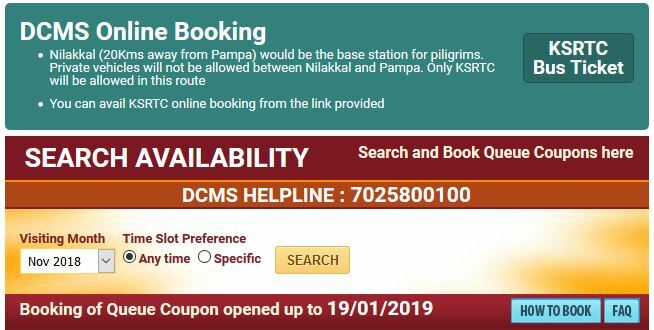 So KSRTC gives the best way to reach pampa river bank and get in virtual q entry darshan at Kannemoola Ganapathi Temple. Visit Kerala RTC website named keralartc.com or visit sabarimalaq.com. The Buses will starts operating from 18th of November till end of season in January 2019. There on home page you will find the checking of Availbale darshan entry slots for Virtual Q Tickets. 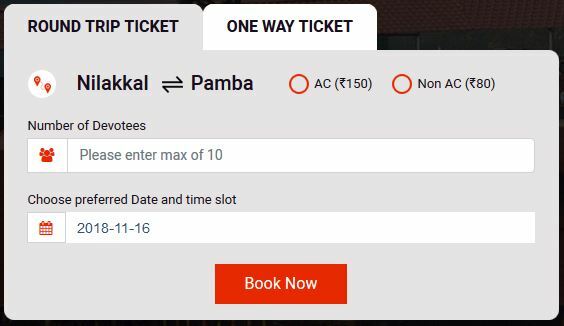 Above it a notice will say that KSRTC Tickets from Pampa to Nilakkal & Nilakkal to Pampa book online. KSRTC runs two types of services in this shuttle route. One is Air Conditioned and other is regular. Every devotee who need to reach Pampa Kannemoola Ganapati Temple must travel with a KSRTC bus. Air Conditioned Bus tranvel charge was 150 Rupees and Regular bus cost 80 rupees. But No option for One-way ticket was given. Sabarimala Temple Virtual Q tickets need to book separately. SabarimalaQ Bus tickets are available to book 2 days in advance from the date of journey. Visit Keralartc.com website form instant booking. Devotees can book maximum 10 tickets per single transaction. No cancellation or Further Transfer of booked ticket is allowed. PLS. ISSUE A ROUND TRIP TICKET FROM NILAKAL TO PUMPA AND BACK. There should be an option to cancel the ticket also….